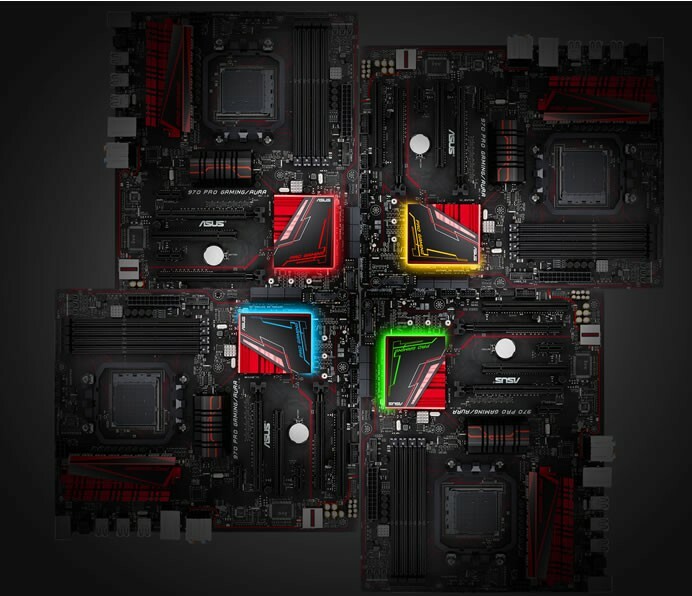 Asus today announced world’s first motherboard -970 Pro Gaming/Aura, based on the highly-anticipated AMD 970+SB950 chipset, with official NVIDIA SLI certification for epic up to quad-GPU graphics, plus integrated Aura RGB. As the latest member of the value-packed ASUS Pro Gaming series, 970 Pro Gaming/Aura has multiple exclusive features for superior gaming experiences. These include gaming-grade Intel Gigabit Ethernet with Asus LANGuard and GameFirst technologies for fast, safe and lag-free networking, and SupremeFX with Sonic Radar II for flawless in-game audio that keeps 970 Pro Gaming/Aura gamers one step ahead on the battlefield. 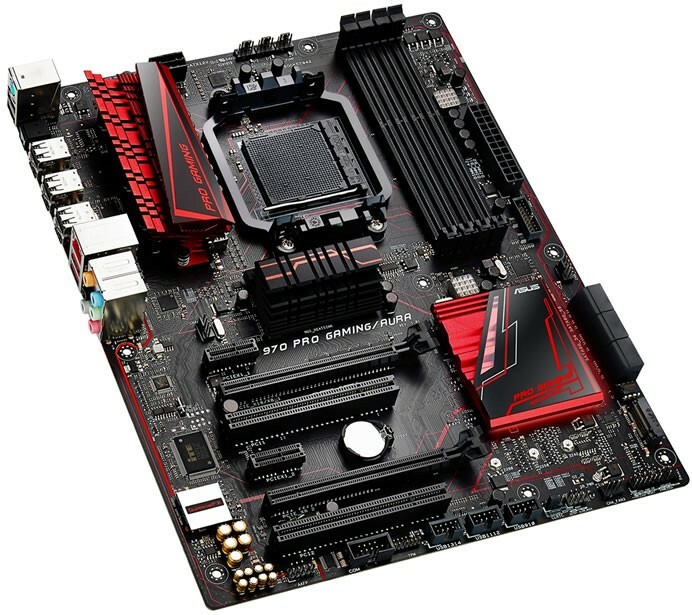 Asus 970 Pro Gaming/Aura is the latest motherboard to benefit from Aura, the all-new LED-illumination technology invented by Asus— and exclusive to owners of Asus motherboards. Aura makes it easy to light up any 970 Pro Gaming/Aura gaming rig with an endless spectrum of color combinations, as well as enabling loads of fascinating and fun effects. Aura includes simple software controls for customizing the LED lighting. The intuitive interface lets gamers cast a stunning multi-color glow across their 970 Pro Gaming/Aura builds, including a breathing effect, color-strobing and color-cycling, plus the ability to change shades to indicate CPU temperature, or pulsate in time to the beat of favorite music. Compatible with the latest processors for the AMD AM3+ socket, 970 Pro Gaming/Aura delivers flexible cooling with a dedicated water-pump header, plus intuitive Fan Xpert controls. The new board also has the very latest connectivity built in, including USB 3.1 Type-A and NVM Express (NVMe) M.2. Exclusive RAMCache technology accelerates game loads, durable Gamer’s Guardian components ensure longevity, and smart DIY features protect users and ease every build. 970 Pro Gaming/Aura is the first AMD 970 chipset-based motherboard on the planet to receive official certification for compatibility with NVIDIA SLI, enabling up to two-way, quad-GPU setups for epic graphics performance. 970 Pro Gaming/Aura is engineered with ASUS-exclusive SupremeFX audio technology for in-game sound that’s alive with realism. The purity and stability of the remarkable 115dB signal-to-noise ratio (SNR) is assured, with a shielded design, electromagnetic-interference (EMI) cover and voltage-protected 5V power supply. The new 970 Pro Gaming/Aura motherboard enables gamers to become hunters rather than the hunted with Sonic Radar II, a stealthy overlay that shows what opponents and teammates are up to on the battlefield — all managed via a simple control panel and customizable game list. 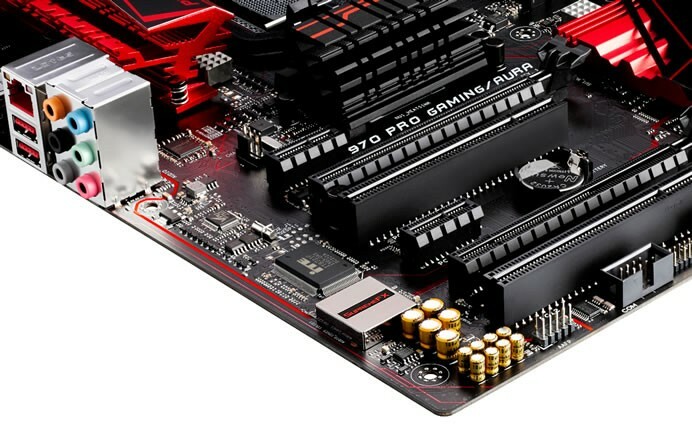 970 Pro Gaming/Aura has the newest connectivity built in, with up to 10Gbps USB 3.1, and an integrated M.2 socket for the latest high-speed solid-state drives (SSDs). It also includes uniquely-intelligent RAMCache technology to launch favorite games and apps launch at breakneck speeds. A dedicated onboard water-pump header ensures that best water-cooling efficiency is instantly accessible. 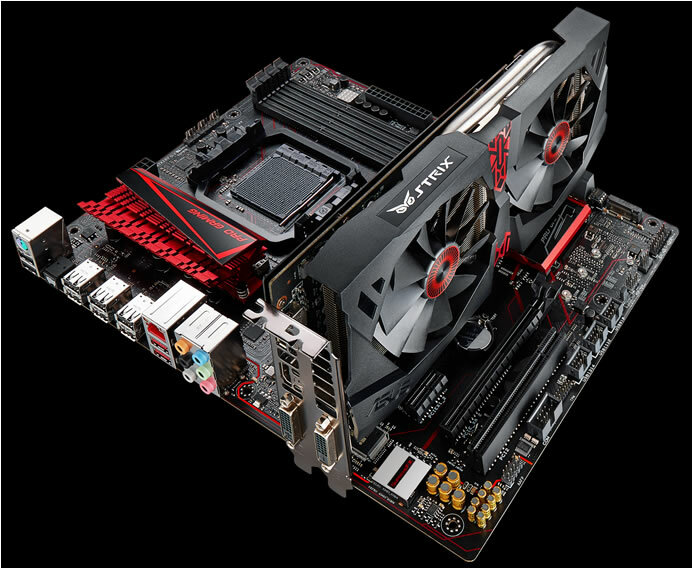 Easy-DIY features include one-clip Q-Slot graphics card installation, one-clip Q-DIMM memory installation, Q-Shield to prevents nicks and cuts during building and four Q-LED lamps for quick boot diagnosis.